Fickle Feline: These Boots Are Made For Walking. Yes, it's September. And yes, Max is already wearing his snow boots. You would too, if you had boots like his. They are Geox Junior Boys Snow Boots. We call them "moon boots" because they look so technologically advanced that we would hazard a guess that they are the official uniform of astronauts at NASA. Why, you ask, does Max need fancy "moon boots"? He needs them because this child, much like his father, will not tolerate cheap footwear. The one time I bought him cheap boots, he absolutely refused to wear them (plus he acted like he couldn't walk in them, but whatever). Scott ended up taking him out and getting him fitted for Geox boots. In the end we ended up buying him two pairs of boots. This year I just went ahead and bit the bullet, got him the expensive boots right off the bat. And he loves them. He loves them so much that the moment he catches sight of them, hidden the back of the closet, he demands to wear them. All day. On a sunny day in September. 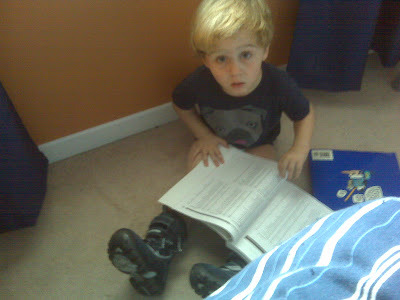 No pants, no socks, just a boy and his boots. Quite a vision really. He wore them from noon until bedtime, when he was finally willing to take them off for his bath. Good thing they are specifically built to breathe, so his feet didn't sweat. I guess that's part of what you're paying for. Not to be outdone, Cameron also loves her boots. More on that later though. I have to dig my old boots out to take to the shoe repair place to get the heels fixed. No new boots for me this year! Leith's new favourite song is "These Boots are Made for Walkin'", which he sings everytime we see someone wearing boots. This morning Charlotte asked to wear her new winter hat, mittens, scarf and boots to school. Her boots aren't nearly as fancy though! No new boots for me this year either :( Although I did just purchase the most magnificent handbag. I will be posting photos of it on my blog later today - I have to share the joy.